In some complex network environment, administrator would run SNMP software efficiently monitor whole network. For TP-Link T1600, T2600 series switch, you could monitor and display the CPU and Memory utilization by using SNMP software. So here we list the OIDs that display the CPU and Memory utilization for your reference when you need. 1. 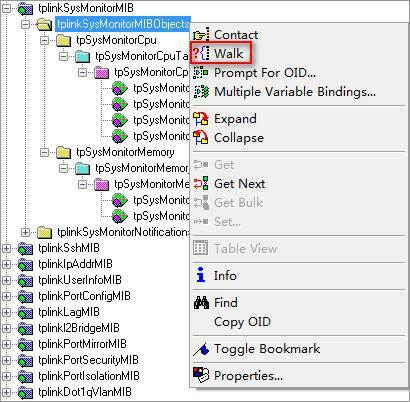 The OID of ‘tpSysMonitorCpu5Seconds’ is 1.3.6.1.4.1.11863.6.4.1.1.1.1.2. 2. The OID of ‘tpSysMonitorCpu1Minutes’ is 1.3.6.1.4.1.11863.6.4.1.1.1.1.3. 3. The OID of ‘tpSysMonitorCpu5Minutes’ is 1.3.6.1.4.1.11863.6.4.1.1.1.1.4. 4. 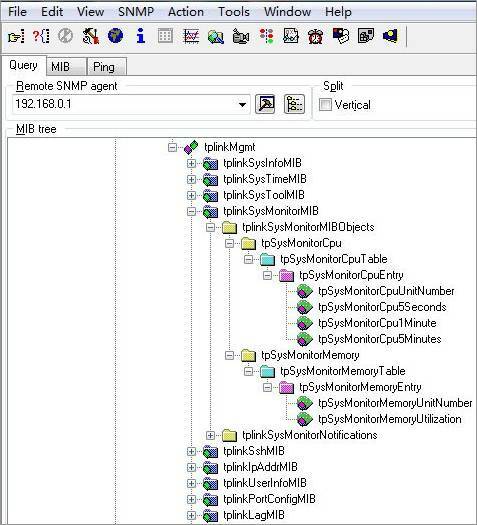 The OID of ‘tpSysMonitorMemoryUtilization’ is 1.3.6.1.4.1.11863.6.4.1.2.1.1.2. 1. Use SNMP software to import the MIB file of switch. For the TP-Link private MIBs files, you need to download from TP-Link official website. tpSysMonitorCpuUnitNumber.1 (integer) 1 means the unit number is the first one. tpSysMonitorCpu5Seconds.1 (integer) 9 means the CPU utilization in 5 seconds is about 9%. tpSysMonitorCpu1Minute.1 (integer) 15 means the CPU utilization in 1 minute is about 15%. tpSysMonitorCpu5Minutes.1 (integer) 10 means the CPU utilization in 5 minutes is about 10%. tpSysMonitorMemoryUnitNumber is the same meaning as tpSysMonitorCpuUnitNumber. tpSysMonitorMemoryUtilization.1 (integer) 80 means the Memory utilization is about 80%. Note: If you have any other demand for the OIDs information, please contact support@tp-link.com.